Most mothers don’t have time for long conversations. They may want them, crave them, begin them again and again—but they are constantly interrupted by kids, partners, work and the day-to-day of busy lives. Between Interruptions is a remarkable collection of original essays by Canadian writers that explores what is unspoken, cut off or lost in those interrupted conversations. Between Interruptions asks what becomes of us when our children’s lives interrupt our own. What prayers, what cries, what taboo thoughts are suddenly left unspoken? Marina Jimenez struggles with her decision to return to her job as a journalist—in a war zone. Carrie-Anne Moss lets us into her home during her self-imposed, forty-day seclusion after the birth of her first son. Chantal Kreviazuk learns to surrender to the limitations of motherhood. Joanna Streetly struggles to find a balance between protecting and letting go. Elizabeth Renzetti and Katrina Onstad search for friends in mommyland. And Estee Klar-Wolfond finds perfection in autism. 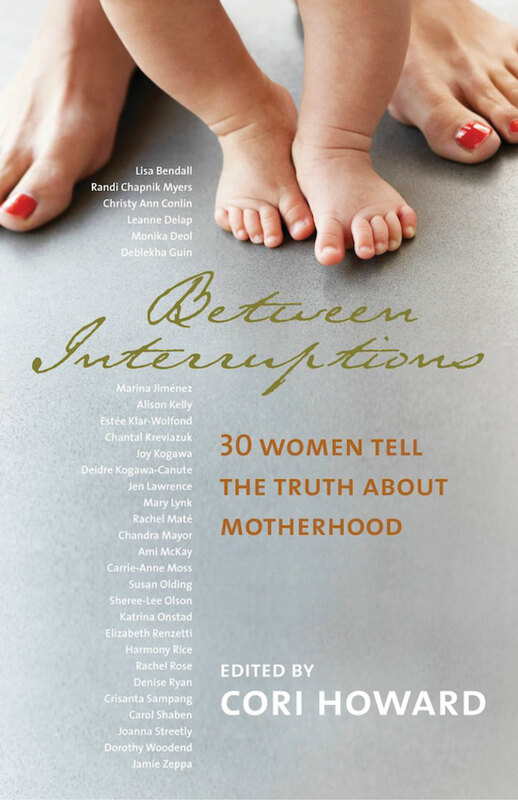 Refreshingly honest, Between Interruptions highlights the differences and similarities between mothers today and generations past. It is, without a doubt, a conversation worth having. WANT TO SHARE YOUR OWN STORY OF MOTHERHOOD? Cori has helped hundreds of women tell their stories. Join Cori on a writing retreat or learn more about her writing and editing services.